Arsenal’s Spanish midfielder says time spent in Scotland made him a star. 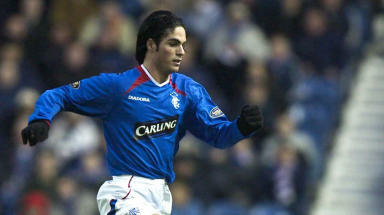 Arsenal’s Mikel Arteta has credited Rangers with helping him develop into a top player. The Spanish midfielder moved to Ibrox in 2002 from Barcelona and after two years in Glasgow he moved back to Spain to join Real Sociedad, having won a league title, a Scottish Cup and a League Cup..
His time at the Anoeta Stadium was short-lived and he moved to Everton, initially on loan, in 2005. Arteta claims that he was forced to toughen up during his time in the SPL and that the experience made him capable of moving to the English Premier League. The Barcelona starlet was on loan at Paris St Germain when Rangers spotted him and said that the experience of playing at Ibrox helped sell him on a move. “In my second year at Paris St-Germain we played Rangers in the Champions League at Ibrox,” he told Arsenal’s official website. “I was really impressed with the stadium and everything that went with it. “In February that year they came over and said they wanted to sign me. At the time I was only on loan in Paris and Barcelona wouldn't sell me to another Spanish club. “It wasn't easy to find another club like that because they were asking for quite a lot of money for me for my age. So I took the chance to go there. At that moment, Rangers were a big club, with big players, playing in the Champions League.